Rajiv Sikri was a career diplomat for more than 36 years with the Indian Foreign Service. 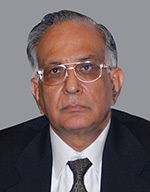 He retired in 2006 as Secretary in the Ministry of External Affairs. In this capacity he had overall responsibility for India’s relations with East Asia, ASEAN, Pacifi c region, the Arab world, Israel, Iran and Central Asia. Earlier he was Special Secretary for Economic Relations supervising foreign economic relations, including India’s external technical and economic assistance programmes. He has served as India’s Ambassador to Kazakhstan, and headed the Departments dealing with West Europe as well as the Soviet Union and East Europe in the Ministry of External Affairs. His other diplomatic assignments abroad include Deputy Chief of Mission in Paris, Political Counsellor in Moscow, Deputy Consul General and Commercial Consul in New York, and Political First Secretary in Kathmandu.